Payroll and payroll taxes are confusing, and laws change depending on your type of business and where you are located. This article is designed to take you through the basics of paying employees, setting up a payroll system, and complying with federal, state, and local laws regarding payroll taxes. By the time you have worked your way through this step-by-step article, you should have a good basic understanding of payroll and payroll taxes, and you will find many resources along the way. The information in this article and on this site is intended to be general in nature and is not tax or legal advice. Each business situation is different and federal and state laws change. Be sure to consult with your business financial advisors before you make important decisions regarding payroll and payroll taxes. And, in particular, you should know the difference between the terms​ ​"payroll taxes" vs. "employment taxes." Employers have general responsibilities to comply with federal and state laws regarding payroll. For example, you must pay a departing employee within a specific time limit after the last day worked. Read about these responsibilities so that you can stay within the laws. From the time you hire your first employees, you have some specific responsibilities to pay these employees and report amounts paid, deducted and withheld. These responsibilities come from federal and state laws. Take a minute to familiarize yourself with these laws. The Fair Labor Standards Act (FLSA) is the federal employment law that regulates all employers, in matters such as minimum wage, child labor, and overtime. Take the Department of Labor's quick quiz (linked in the article) to see if your business must comply with the provisions of the FLSA. Hint: You probably have to comply. In the process of setting up your payroll, don't forget to check the employment laws in your state. Many states follow the federal laws, but each state has its employment laws, and you want to be sure you follow them. For example, some states have stricter laws on child labor than the federal laws, and some states have different minimum wage laws. The rule of thumb is that you must follow the laws that are strictest. So if your state's laws are tougher than federal laws, you must follow state laws. Better find out now. Before you begin to deal with payroll, you should understand all the taxes related to payroll. Spend some time familiarizing yourself with these taxes, and check to see if your state and local governments levy income taxes. Because FICA taxes are required to be withheld from all employee paychecks, they are an important tax, so take a few minutes to focus on how FICA taxes work. Types of payroll taxes imposed by states include (1) income tax withholding, (2) unemployment taxes and funds, (3) workers compensation funds payments, and (4) disability funds. This article describes the types of payroll taxes and where to find information on these taxes in your state. Of course, you can always search [state name] and "payroll taxes" for specific information. It's finally time to begin discussing payroll processing and payroll taxes. To start this discussion, let's look at what you need to do before you hire your first employee, then how you need to process each new employee at hire, and how you register as an employer with federal and state agencies. If you have employees, you must have a federal Employer ID Number (EIN). An EIN is a unique federal identifier for businesses, like a Social Security number. It's easy to get this number; you can get it online or by phone or fax. You might want to print out the application form (SS-4), fill it out completely, then go online and file. You will need to go to your state's department of revenue and register as an employer. If your state has an income tax, you will need to find out how employees sign up for withholding (a state W-4 form or equivalent). Then find out how and when your state wants you to pay and report on state income tax withheld from employee pay. Also check on state unemployment and workers' compensation (and disability insurance, if your state requires it). You must also sign up for the state system to register new hires, so all states know about hires, for wage garnishment purposes. And an I-9 form, on which the employee attests to his or her eligibility to work in the U.S. You may also want to register with E-Verify, the federal system for verifying employee eligibility. This article explains these documents and why they are important. The information in this article will help you gather up the forms you need for your first new hire. One more task before you begin paying employees: You must make some decisions on how and when you will pay employees, including (1) what pay periods you will use, (2) whether employees will be salaried or hourly, (3) what constitutes a full-time employee, and (4) when you will pay overtime. Begin your payroll process by calculating gross (total) pay for each employee. The gross pay calculation is different for salaried and hourly employees, and hourly gross pay includes overtime. Gross pay minus all withholding and deductions equal net pay. After you have completed your payroll calculations, including withholding, deductions, and payroll tax amounts, after you have paid employees, your next task is creating payroll records. For each employee, you must keep detailed records on what you paid, what you deducted and withheld for taxes and optional deductions. You must keep a running year-to-date record and be able to show these records to payroll auditors. Yes, you have to keep these records for the entire time an employee is with your company. In addition to creating an individual earnings record for each employee for each pay period, you must total all categories and include them in a payroll register, accumulating these totals for tax payments and reports. Of course, you don't have to create these records manually. If you have payroll software as part of your accounting system, these records are created manually. Then you just need to be aware that these records are available. Writing a payroll and paying employees creates federal and state payroll tax obligations. 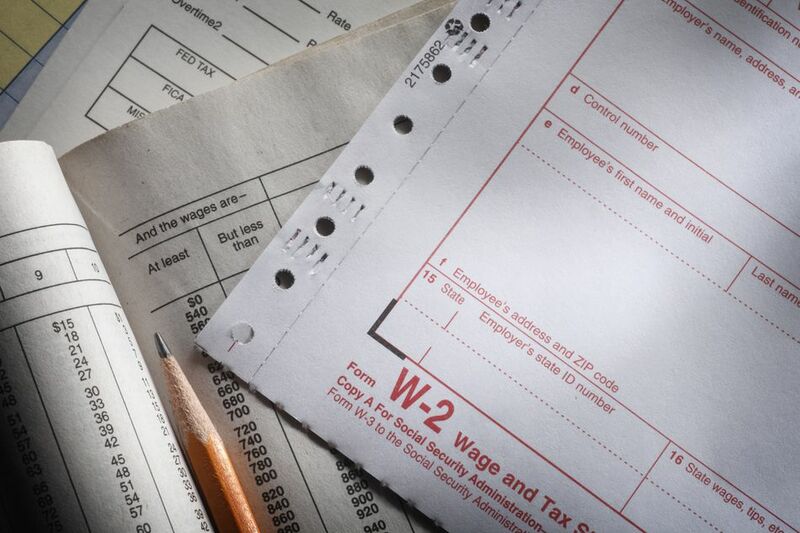 This section discusses when to report and pay payroll taxes. Paying employees is just the beginning of your payroll work. Now you must make payments to the appropriate agencies (federal, state, and local) at the correct time. Confused yet? First, let's federal tax payments you must make: how much, when, and what deposit method the IRS wants you to use. You must make federal unemployment tax deposits either quarterly or annually, depending on the amount you owe. Each quarter you must send a payroll tax report to the IRS on Form 941. The report shows (1) amounts you have withheld from employee pay for FICA, and federal income tax withholding, (2) amounts owed for withholding, and your employer portion of FICA, and (3) amounts paid by you in your deposits (monthly or semi-weekly). If you still owe money, you must make a payment with your report. After each calendar year, you must send annual wage, and tax summary reports to employees (Form W-2), so they can use the information to prepare their federal income tax returns. These summary reports are due to employees by the end of January. Then, you must put all employee W-2s together with a composite Form W-3 totaling all W-2 information and send the lot to the Social Security Administration, by the end of February. This article will take you through the dates and steps to complete this task. As noted before in this step-by-step article, each state has different regulations for paying and reporting payroll taxes. Check with your state to see how to handle these regulations. You might be wondering why this step is at the end rather than the beginning of this article. It's because you need to know all the ins-and-outs of payroll and payroll taxes before you can decide how to do payroll processing. It depends on the complexity of your workforce, the number, and types of employees you have, and your internal and external resources for doing payroll. Before you start evaluating payroll services, run through this question list. The questions will help you clarify what type and level of services you need, based on your current and future employee level and type of business. This key article has lots of information to walk you through the steps in creating a payroll system. First, a review of the tasks involved in payroll and payroll tax processing, then review the three main options: 1. DIY with software, 2. a payroll service, or 3. a bookkeeping service. Finally, I have an article on how to compare payroll services. By the time you complete this reading, you'll have a pretty good idea of how you want to handle payroll/payroll taxes. To help you figure out what's due when here is a month-by-month list of federal payroll and employment taxes. The list includes due dates for payroll taxes (FICA and federal income tax) and federal unemployment taxes (FUTA).